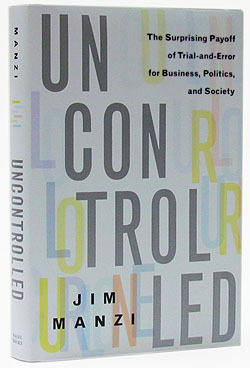 The title of Jim Manzi’s new book, Uncontrolled, is a play on words. In its first sense, it’s about the difficulty of controlling for confounding factors when you perform a statistical analysis. If you’re comparing charter schools to public schools, for example, you need to control for things like income and prior test scores in order to make sure you’re really looking at the effect of just the schools themselves, not being fooled by the fact that one might have had a better group of students to begin with. Unfortunately, as Manzi points out, no matter how many things you control for, it’s almost impossible to know if you’ve really controlled for everything. The problem is what Manzi calls “causal density.” If you’re studying the orbit of a planet, you can pretty much assume there’s only one important cause of the planet’s movement: gravity. Causal density is low. In medicine, there are more things to worry about, but a lot of problems are still tractable. Causal density is moderate. But in human affairs, there are lots of causes of everything, there are causes of the causes, and the causes often interact in complex ways. Causal density is very high, which means it’s very hard to make sure you’ve accounted for everything. No matter how sophisticated your statistical tools are, it’s always possible that something you haven’t thought of is lurking in the background and throwing off your results. So what’s the solution? This is the second sense of uncontrolled. The answer, Manzi says, is allowing businesses to perform lots of random experiments. Go wild, because you never know what might work. But there’s one catch: Although trial and error should be king, you should also insist that every experiment be performed rigorously enough that you can glean useful information from the results. I’m enough of a geek that I found this the most arresting part of the book. Although Manzi’s right about the difficulty of multivariable analysis in the social sciences, in the end I don’t think it’s quite as futile as he makes it out to be. Add to that the fact that the only studies he finds reliable all support conservative interventions (charter schools, broken-windows policing, work requirements for welfare), and you might feel like he’s loading the dice a little too heavily in favor of his own ideological convictions. And this feeling only increases in the last chapter, where he recommends several policies that have nothing to do with random experimentation at all. The federal government has certain specific roles under the waivers approach. It enforces whatever rules are in place at any given time. It guarantees consistent, reliable information: results of consistently executed RFTs when possible, and general statistical information when experiments are not feasible…The federal government would be metaphorically “making a market” in policy improvements. There are plenty of things to argue about here, including the scope of the waivers and the rigorousness of the federal government’s oversight. But it’s unquestionably an interesting idea. Manzi claims that these kinds of experiments have become routine in the business world (a decade ago he founded a software company to help businesses do just that), and he recommends a goal of running 10,000 social policy RFTs per year. Why so many? Partly, he says, because the vast majority of experiments don’t work, so you need lots of them to find any winners, and partly because you need to make rigorous experimentation ingrained in the culture of governing, and the only way to do that is to make it routine. And if these experiments start showing that liberal ideas work, too, as they almost certainly will? I guess we’ll cross that bridge when we come to it. In the meantime, it’s a provocative proposal, and a reality-based challenge to Manzi’s fellow conservatives.